It will started way back few weeks back when I have problem login into Citibank Malaysia online banking website. I made a call to the call center and after being route to here and there, some one from the bank said the system has been updated, some people will get affected. So mar, I asked to reset the password, after trying 2 methods, only left the ATM card method, which mean use the ATM card password to activate the online account again. The thing is I forgot the ATM card password at all, because I haven't use it for more than 3 years...... Okay, then I asked them to send me a new password. I waited and waited for 2/3 weeks but still haven't get the new password. So I call them up again today, after waited for more than 5 mins someone pick up and after I told the story, he divert me to a banker. Okay, after waited for another more than 5 mins, the call divert back to the the first person saying banker is busy, they will call back tonight. Last night I made a call to EON bank and it took me less than 5 mins to verify and activate a new credit, I have also ask some questions to that guy, it all took less than 5 mins! Huh? You don't have enough staff r? Who make the changes one? Why don't you have backup plan in case the new system screw up r? When I downloaded this JAVA game I thought it is the "scramble" game. After install it I only realize this scramble is not THE scramble, haha. It is a freeware Java game. So no need to pay lo. But you need to have MIDP2.0 installed on your phone first la. What is MIDP? It is like the JAVA runtime on your computer, except this is the lighter version of it and use for handphone/PPC/smart phone. Some phones which are not ppc/smart phone (meaning dumb phone :P), but the manufacturer per-install the MIDP in your phone and you have some spare space in the phone, then you can download the JAVA games/apps to play/use on your phone. The advantage of JAVA is you just need to write the games/apps in JAVA language and it can be play/use on any plateform that has JAVA runtime. Meaning hor, don’t care it is window9* (do you still have it?????? ), WinXp, Win Vista, Win7, linux, unix, (mac? not sure le), etc etc, as long as you have JAVA runtime installed in your pc/laptop, you can run it. For phone, don't care you have Nokia (or China made Nokla :P), Sony E, iphone, HTC, dopod, etc etc, you have MIDP, you can play/run the JAVA games/apps. Anyway back to the game, it is just a 2D shooting game. You need to rescue the people and avoid being hit by other planes, or hit on floor and castle. And at the end land on a landing area to complete a round. No sound at all, so very boring lo after a while. This is another game that is not suitable for My HTC touch, because pressing up down left right and fire is very inconvenient. Use your phone as ruler? Ever thought of your phone can use as a ruler? Well, by attaching a laser transmitter and laser sensor and also a measurement software, you should able to get very accurate ruler. Just joking, but this kind of software does exist, not as accurate as laser ruler la. 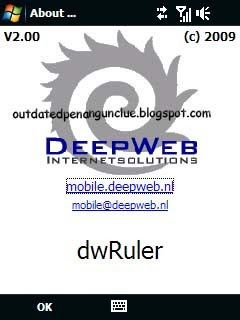 Introducing dwRuler. It is a freeware, so don't need to be worry about the money. Haha. After install it and before start to use you need to calibrated it with a real ruler. IMHO, the software will based on the length you key in and make some simple calculations to determine the ruler that going to show on your phone screen. You can also set the unit in cm or inch. As for the dm/m/ft, I am not sure why it is there at first place, haha. 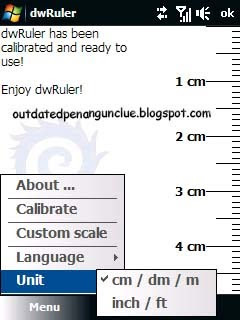 I did compare the ruler this software rendered with the real ruler, quite accurate. What can I expect more when the real ruler I have also not very accurate one la. Haha.